Having been asked by the Revd Mr Johnson to jot down a few notes about my upbringing and the manner of my arrival in the colony, I will attempt to do so, but I should say at the outset that I have little of interest to relate. I have not contributed much of worth to the world, as will no doubt become obvious in the pages that follow, and indeed I sometimes wonder that I even survived the trials and tribulations of my earliest years. So begins the story of Barnaby Fletch, a young convict recounting the tale of his childhood and early years in the colony of New South Wales. As would be expected, his protestations belie the absorbing story which follows. Fletch has been on his own on the streets of London for as along as he can rememberer, with no knowledge of his family. He relies on what he finds, or can steal, and shelters wherever he can, although his favourite place is within the walls of St Martin’s church. A chance encounter with a returned convict makes Barnaby wonder whether transportation to the strange new land of which the stranger tells might provide an opportunity for a better life, so he decides to do what he can to get himself caught and transported. Eventually, though not without some difficulty, he finds himself bound for Botany Bay, and whatever that may hold. 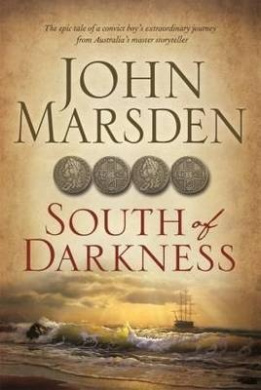 South of Darkness is John Marsden’s first foray into writing for adults, though young adults readers may also enjoy this tale of hardship, survival and adventure set against the backdrop of colonial Australia and England and with a distinctly Dickensian feel. Fletch is an endearing narrator – surprisingly literate for his lack of formal education – and, while he does not give his age as narrator, the events of his childhood are told largely through the lens of childhood naivety, leaving readers to interpret and react. There is the hint of a sequel in the final lines, and it is to be hoped that it will come, because readers are left wanting to know what is next in store for young Barnaby. Horatio stared at him. The flickering light of the candles in the dark draughty room made the prince’s face almost demonic. Through the cloverleaf window in the stone wall Bernardo saw one distant star. Then it went out. Hamlet was staring back at Horatio. Something is rotten in the state of Denmark. Hamlet’s father, the king, has died, and Hamlet’s mother has quickly remarried, to the new king, Hamlet’s uncle. But Hamlet has been visited by the ghost of his father, who claims he has been murdered and urges Hamlet to take revenge. This is not a new story – it is, of course, a retelling of the famous play by Shakespeare. Master writer John Marsden remoulds the story staying true to the plot of the play but rediscovering the characters, giving them depth, and retouching the events to give them further layers. Fans of the play will not feel cheated by the changes, but will rather be delighted by the interpretation, whilst those new to the play will enjoy the story for its own sake. John Marsden is best known for his books for children and young adults, including the unforgettable Tomorrow series. Here, though, he offers something very different – an anthology of poems for special occassions – most specifically for reading at weddings and funerals. It was put together, Marsden says in his introduction, to offer a selection of special poems to add a personal touch to events – so that everyone who takes part in ceremoniies (can) have something chosen specifically for the occasion. The weddings section of the book offers well known pieces such as Marlowe’s ‘The Passionate Shepherd to his Love and Edward Lear’s The Owl and the pussycat’ as well as lesser known offerings such as a translated Apache Song. The funeral section is similarly diverse, with offerings from Emily Dickinson, WB Yeats, Robert Louis Stevenson and many more. This is a special collection with a lovely selection of peoms for special occasions.